My second-most-favorite 4 letter word: DONE. Not COMPLETELY DONE. Saving those two words for later. All of these "DONE"s represent the first 2 1/2 minutes of From Inside. That's about 1/2 of the pick-up shots I've mentioned in the last few posts. 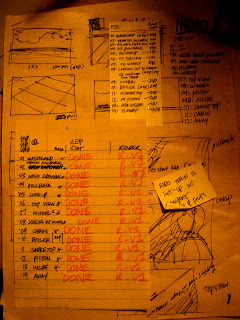 I promise to follow up this photograph of a shot list with the actual shots. The whole scene. Soon.